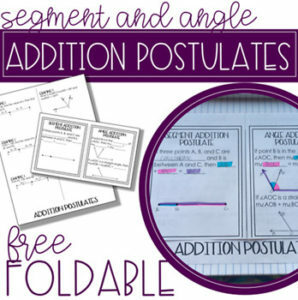 This free product is a foldable for the Segment Addition Postulate and the Angle Addition Postulate. It includes an answer key and a picture of the completed foldable. ©Copyright 2017 Kacie Travis. All rights reserved by author. This product is to be used by the original purchaser only. Copying for more than one teacher or classroom, or for an entire department, school, or school system is prohibited. This product may not be distributed or displayed digitally for public view, uploaded to school or district websites, distributed via email, or submitted to file sharing sites such as Amazon Inspire. Failure to comply is a copyright infringement and a violation of the Digital Millennium Copyright Act (DMCA). Intended for single classroom and personal use only.